Wild garlic is a truly idyllic culinary treat - a wild ingredient that, when in season, grows in abundance, nestled among bluebells, attracted by the moist soil and shady woodland environment. Wild garlic has enjoyed a culinary boom in recent times, taking its place alongside rhubarb and asparagus as a pillar of spring's bounty. Although the pungent smell of garlic makes it easy to identify, always take care when foraging your own ingredients - there have been cases of people mistaking poisonous plants for wild garlic and suffering the consequences. Wild garlic can be identified by its distinctive smell, long pointed leaves and white flowers, which bloom at the end of the season. Don’t pick wild garlic that has large amounts of white flowers, as this indicates that the plant is slightly past its best. Wild garlic doesn’t have to be foraged - it’s a frequent staple of food markets at the peak of the season. 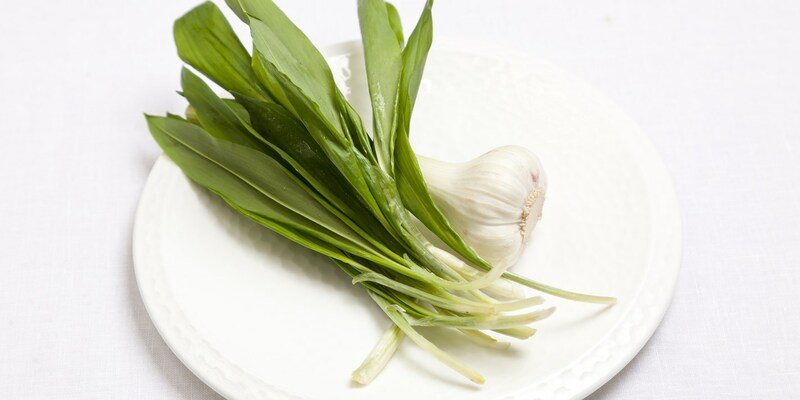 As with all vegetables, choose wild garlic with bright, fresh leaves and avoid specimens that have wilted. Wild garlic can be eaten raw, but they are much better when cooked - simply briefly blanched or wilted for about 1 minute as you would with spinach. Like spinach, wild garlic leaves shrink down a lot after cooking, so make sure you have plenty to go round. Always wash wild garlic before cooking, and keep the vibrant colour after cooking by plunging into iced water, as recommended by Christoffer Hruskova. Although the scent of wild garlic is powerful, the flavour when cooked is a little more subtle. For this reason, it makes a wonderful flavouring when whizzed in a food processor and added to tart fillings or mayonnaise, as Pete Biggs demonstrates in his wild garlic mayonnaise. Adam Gray even uses wild garlic to make beautiful cream cheese toasties as an accompaniment to a spinach soup. Its roots being firmly planted in spring, wild garlic is a natural accompaniment to other flavours of the season. Colin McGurran transforms wild garlic into a velouté to accompany his Chicken and asparagus recipe, while Shaun Rankin uses wild garlic in a risotto for his Rump and rib of lamb. Wild garlic also holds up to bolder seasonal flavour combinations -James Mackenzie’s Black pudding and langoustine crumble comes with a crisp wild garlic crust. For a unique wild garlic-infused canapé, try Simon Hulstone’s Onion with wild garlic and snails, the mild wild garlic pairing beautifully with the sweet onion and punchy snails.